CLICK HERE for information about my "Underground Manhattan" subway tour. 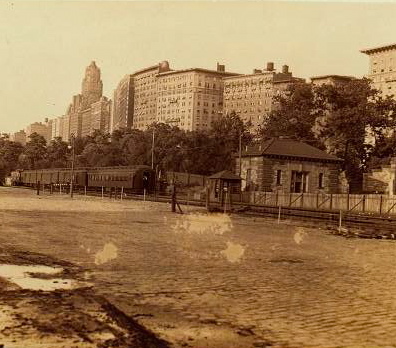 The little inlet, or bay, is the current site of (probably) the red clay courts in Riverside Park. Once a beautiful pastoral spot, it inspired the poem "Woodsman Spare That Tree". James Stryker is the name of the land owner and that is his house, indicated on the shore of the bay that would eventually bear the name "Striker's Bay". I always say that New Yorkers love to corrupt things; politicians, policemen, spellings and pronunciations are some of things corrupted in this town since it was called Fort Amsterdam. Stryker, or Striker is anither old New York name. 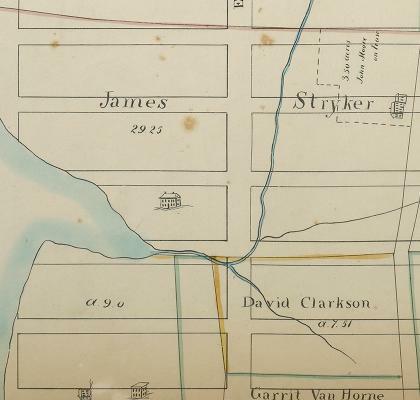 The Stryker family got their hands on this land right after the Revolution from what was once a much larger pre- revolution estate owned by a man named Charles Apthorpe. His estate, Elmwood, was a large spread containing a farm, an orchard and a large house that remained standing late 19th century. Unfortunately for Mr. Apthorpe, he was on the wrong side of the Revolution and as punishment he lost a good deal of land. His daughter however, married a patriot who received the southern piece of the estate and built a large mansion. 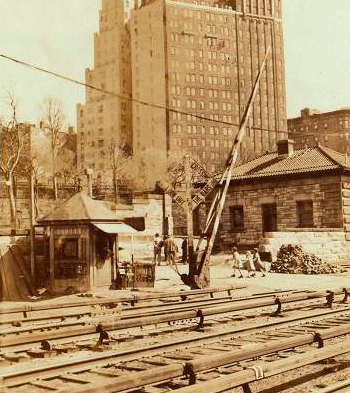 The mansion was torn down in the very early 20th century and replaced with the Apthorpe Apartments on 79th street. Some estate that Elmwood. It was so nice that George Washington used it for a bit as the British chased him up the old Bloomingdale Road. As for the Stryker family, they did just fine, especially through marriage. 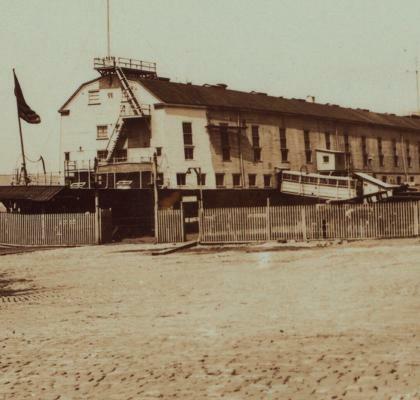 One of the large farms of the colonial era in what is now Hell's Kitchen was owned byAndreas Hopper and his descendants. It spanned the area between what is now 48th Street nearly to 59th Street and stretched from the river east to what is now Sixth Avenue. One of the Hopper farmhouses, built in 1752, stood near 53rd Street and 11th Avenue. 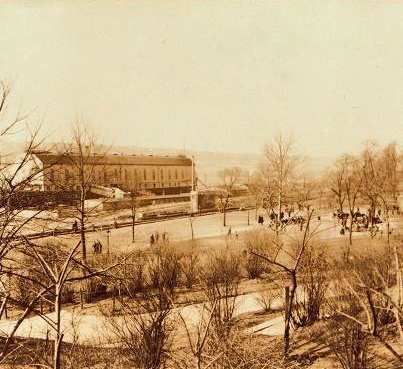 This was the home of the War of 1812 veteran, Gen. Garrit Hopper Striker, and lasted until 1896, when it was demolished; the site was purchased for the city and landscaped as DeWitt Clinton Park. It was the General's ancestor Garrit Stryker who, after Washington's defeat at the Battle of Long Island and the great fire of 1776, took off from the family home and followed Washington up the Bloomingdale Road and out of the city and eventually distinguished himself at the Battle of Trenton. 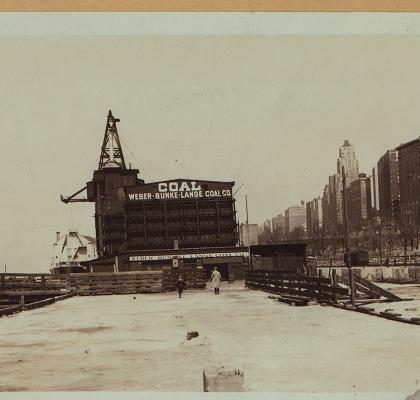 No longer pastoral, the end of 96th street became a dock that served, amongst other things, this large coal facility. Used for hot water and heating in apartment buildings large and small, coal was the thing until we discovered how dirty it is. 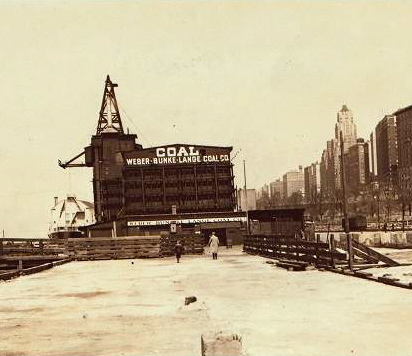 In addition to this facility there was a coal yard on 96th and Amsterdam Avenue. Prior to consolidating his passenger rail service out of Grand Central Station in 1871, Commodore Vanderbilt ran his Hudson River Rail Road as a freight and passenger line. There was once a station here at 96th Street. The U.S.S. Illinois and the New York Central tracks. No security? The sewage treatment plant under Riverbank State Park at least has a guard booth. Will it was a different world. As you probably have noticed over the years, there are no longer any docking facilities at the foot of 96th street and the Hudson River. Robert Moses took all of this away, he cut off the river from the citizens of the west side by improving it with one of his beloved highways. He did, however create more Riverside Park for the citizens of New York City. Once Mr. Moses received the financing for this project from the W.P.A, he became a hero in the eyes of a large number of unemployed construction workers as this was a large scale, big budget project. Some say this park is emblematic of the racism inherit with Robert Moses - the park basically ends at 125th street. While I do not argue that Mr. Moses was not a racist (and potentially more damaging than any one group had ever been in this town) the natural landscape, the plateau that is Morningside Heights, drops off there, just north of Grants Tomb. 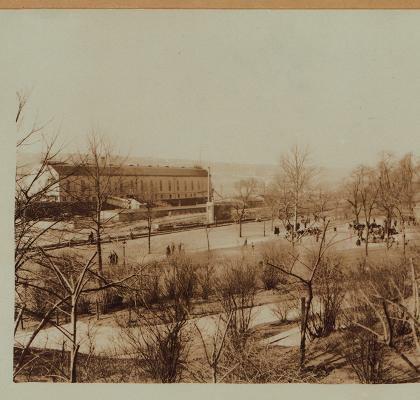 In addition, the street we call 125th street by the Hudson river was already developed industrially by the mid 19th century (the Tiemann Paint factory for example) with the growth of Manhattanville. Natural topography and this community separated the park south of 125th and the park north of 135th. Just to be fair. This is Cleopatra's Needle, a gift from the people of Egypt to the people of New York. Due to the docking facilities here at 96th street, the location being actually the closest dock to where the needle would go, when it arrived in New York harbor from Egypt, the needle was loaded onto a barge then floated up the Hudson to 96th street. Here it is, being hauled east across 96th street on a specially constructed railroad trestle towards Central Park. The smoke stack from the engine pushing the needle is visible at the bottom of the needle. This is looking north from the foot of 96th street. Although no passenger service ran along this line by the time this picture was taken in 1934, that us a passenger car heading north on the left. This is the same spot, just looking south. Watch out kids as you cross the tracks. The third rails indicate that there are no more steam trains coming onto this island anymore. The type of third rail seen here is still used today by the Metro North rail road. These tracks belonged to the New York Central as did what is now most of Metro North. The Roxy Theater, one of New York City's greatest lost palaces. The Riverside and Riviera Theater - An Entertainment Meca On The Upper West Side. New York's very own Waverly Theatre and how it got that way. West 107th and Riverside and it's connection to a castle up north.